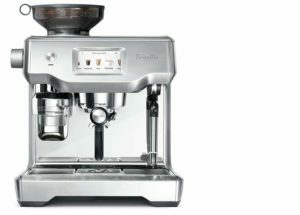 Are you in search of a top-class espresso machine? Your search has completed here, congrats! Breville Oracle Touch is a perfect combination of quality and convenience along with amazingly-simple utilization. So, today, you’ll be familiar with Breville oracle touch review and I’m quite sure you’ll become a fan of this coffee maker. As per its name suggests, the “Touch” exhibits a vibrant 4-inch touchscreen through which you can go through controls and menus, alter settings (as per your choice), and also program as well as save custom drinks – just one touch is needed. The user-friendly screen streamlined its usage for both owners and guests plus it enables personalized drinks and labels to smoother out your coffee making process. Now, let’s find out its features, benefits, and shortcomings in the coming sections. Dual Boiler: Breville BES990BSS1BUS1 Fully Automatic Espresso Machine has come with the separate brew and steam boilers that are meant for fast heat times plus the facility of PID-controlled temperature stability. Electronically Heated Group: This fully automated espresso machine’s group head is featured with a separate heating element that maintains the heat of your espresso shots. Automatic Dose and Tamp: This incredible coffee maker comes with the convenience of hands-free consistency plus an integrated grinder – dedicated to dose and tamp, on an automatic basis. Auto-on: With this auto-on feature, you can easily set a start time on this particular machine. The result is a piping hot espresso shot – ready to relish. Oracle Steam Wand: The brilliant steam wand from Oracle can effectively monitor temperature and bring the air of the adjustable amount. As a result, you’ll get the absolutely perfect milk foam and ideal temperature every time. 58mm Group with Solenoid: The head of this Fully Automatic Espresso Machine is a classic 58mm and it is equipped with a built-in solenoid valve – meant for backflushing. Volumetric or Timed Shots: This coffee maker offers additional flexibility plus programmable shot times, set by time, volume, or monitored manually. Swipe, Select and Enjoy: This espresso machine provides automation at each and every step of coffee making. You just have to swipe and choose espresso, latte, long black, cappuccino, or flat white and enjoy your favorite coffeehouse-style coffee in your comfort zone. Dose Amount: It features an integrated conical burr grinder that can automatically grind, dose, and tamp 22 grams of coffee – similar to that of the commercial machine in your preferred cafe. Product Design: Breville has successfully converted the daily usage feelings into a lavish experience – thanks to its Oracle Touch espresso machine. It houses a bright and responsive touchscreen. This machine is also capable of saving your preferred drink recipes and it’s an absolutely striking improvement in comparison with the original Oracle. Consistent Coffee: The “repeatability” of this coffee maker has made it possible to deliver shot-to-shot – thanks to the Oracle’s built-in fan-tamper. Its brew temperature stability and the volumetric shot programming are also praiseworthy. 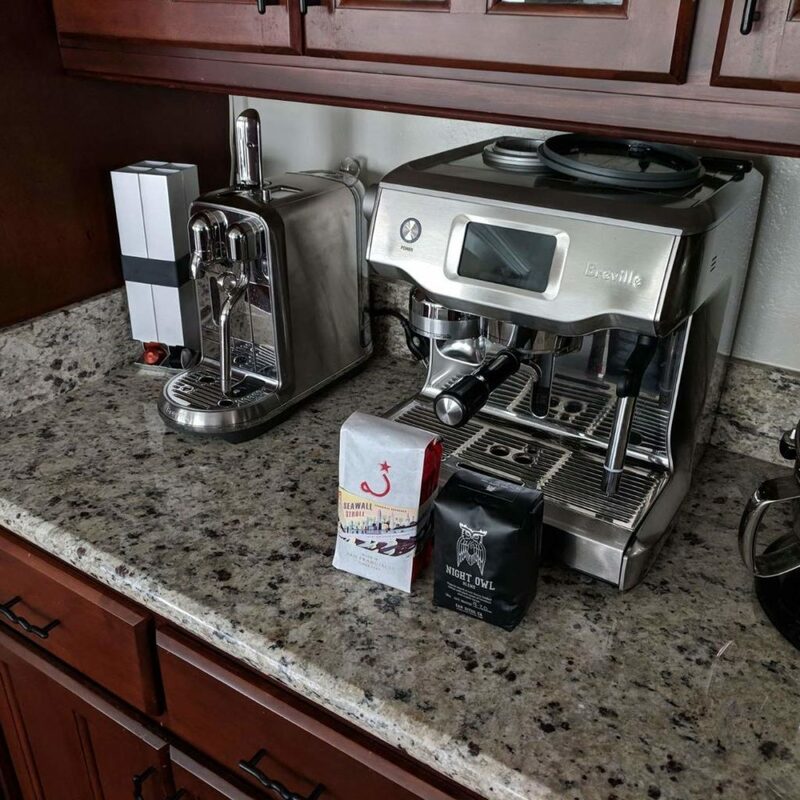 Magic Milk: The Oracle’s steam wand along with auto-aeration and temperature probe is among the best effort-saving functionalities that can be seen on a home machine to this date. You’ll get a luxurious feeling while planting your favorite rose-shaped decoration and then you can put in like a breeze. Even you don’t need to change out the PJs. A Mind-blowing Coffee without any Compromise: With Breville Oracle Touch, you don’t need to compromise in the automatic coffee making process. You’ll be pleased to see automation at its all stages and just touching of your fingertips will produce silky milk textured and full-bodied flavored luxurious coffee. The state of the art super automatic espresso machine has arrived! Streamlined Workflow: “Almost effortless” won’t be an overstatement for Breville Oracle Touch. You’ll undergo a minimal setup process and producing a good shot of coffee from this coffee maker is as simple as a couple of grind adjustments. Choose from the Complete Menu of Cafe Favorites: Breville Oracle Touch has come with automated technology and touch screen so that you can select from top-notch options, such as Espresso, Latte, Flat White, Americano, and Cappuccino. Customize As Per Your Choice: This incredible espresso machine enables its users to modify milk texture, coffee strength, and temperature, as per personal preferences. So, you can personalize your coffee and save it as a favorite with a unique name as well as a picture. You’re free to create at most 8 personalized coffees. It’s true that you’ll get a set of brilliant features, automation, and streamlined controls with Breville Oracle Touch but the investment is big. Likewise, the original Oracle, this espresso machine is also large with the height and width of almost 18 inches and 15 inches. So, you have to measure your cabinets prior to making your purchasing decision. If you are searching for a refurbished oracle touch then you can check other buying option from Amazon.com Or you can check it from official breville site. If you want to get a heavy discount on Breville oracle touch then you should wait for either black Friday deal days or president day sale or st. patrick’s day sale. The Breville BES990BSS1BUS1 Fully Automatic Espresso Machine is an ideal deal for all coffee aficionados. Its dedicated steam and brew boilers, a heated brew group, built-in pre-infusion, PID temperature control etc are some of its mind-blowing functionalities. Like the original Oracle, Breville Oracle Touch’s automatic dosing and a self-tamping grinder (now compatible with both single and double espresso baskets), top-notch automatic milk steaming, volumetric shot programming can throw a stiff competition to many cafes. The breville oracle touch review was an effort to introduce this amazing espresso maker to all coffee buffs. Bring Breville Oracle Touch today and start relishing your favorite coffee without going outside! You can also check out Breville BES920XL coffee maker and find out the most suitable one for you.